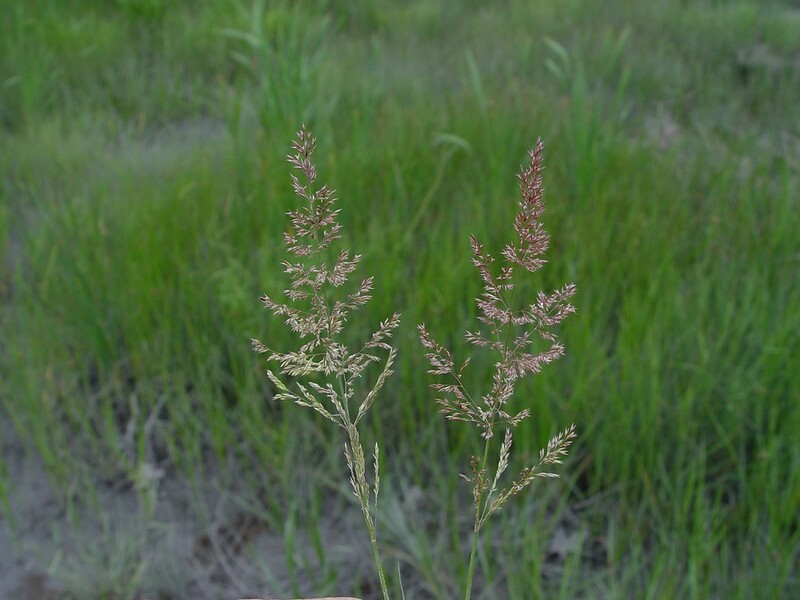 Agrostis stolonifera. rooting stem. By Glen Mittelhauser. Copyright © 2017 Glen Mittelhauser. New England Wild Flower Society. gobotany.newenglandwild.org (Accessed 7/2017). Agrostis stolonifera is a perennial C3 grass (Wilson and Hartnett. 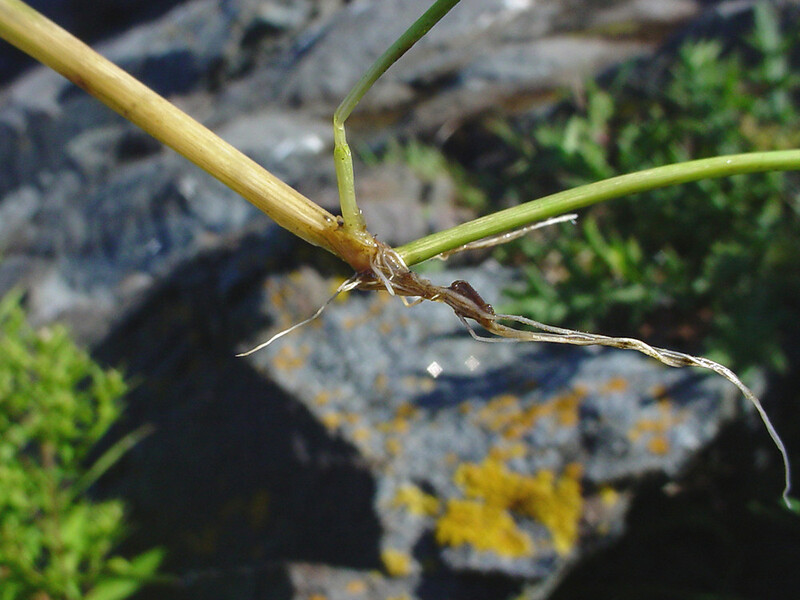 1998; Basinger 2002), to 1 m, stems tufted and sometimes colonial by stolons (no rhizomes), base of stems reclining, often rooting in wet soil (Hitchcock 1950; Clayton et al. 2002+) not clearly different from A. gigantea; branching freely, at least late in season, plant very leafy, with dead leaves often curly along lower stems, plants often becoming matted later in season. Leaves alternate, blade 0.3-0.8 cm wide, ligule 0.3-0.6 cm long (higher than wide), membranous. Agrostis stolonifera. inflorescence. Picture by Andrea Moro. Dipartimento di Scienze della Vita, Università di Trieste – Progetto Dryades. luirig.altervista.org (Accessed 7/2017). 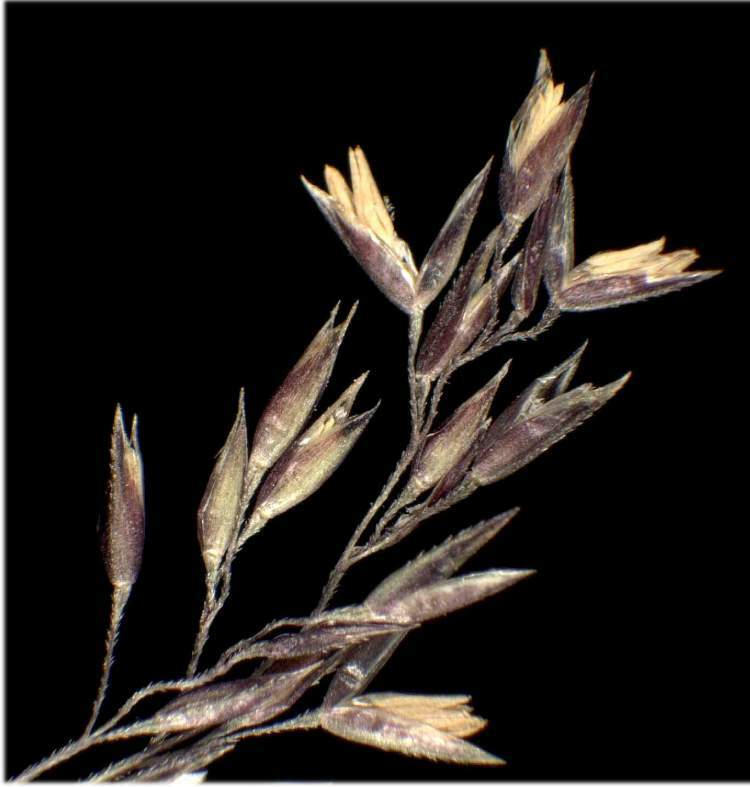 Flowers purplish, becoming pale greenish to straw-colored; spikelets 1-flowered, glumes equal, narrow, as long as floret, lemma thin, hairy at base, palea thin, membranous, up to 2/3 as long as lemma; inflorescence generally densely flowered, narrower than other species of Agrostis to 10 cm long, usually appearing delicate and fluffy, but often contracted and appearing spike-like, branches ascending, unequal, numerous, many short branches with spikelets to nearly to base; blooms and fruits June-July. Habitat: Moist-wet swamp forests and open areas, roadsides, meadows, soil pH 5.1-7.5, tolerant of anaerobic soils; moderately tolerant of fire and salinity; intolerant of shade (USDA, NRCS 2006). Notes: Listed in plant material catalogs and commonly used in cover mixes for restorations and roadsides.